Kosher salt, fresh ground black pepper, medium rare...no need to over-think this one. You bought this delicious hunk of meat, now your job is to not screw it up! Rib eye steaks are a pretty forgiving cut of meat, believe it or not. The fat marbling contained in a ribeye steak makes for a very flavorful and juicy steak without a lot of effort. When buying ribeyes, I like to skip the shelves and go straight to the butcher's counter to get a steak that is an inch to an inch and a half thick. Thicker steaks allow you to create a great crust on the outside while cooking them to a perfect medium-rare on the inside (you wouldn't ruin that nice steak by over-cooking to well-done, would you??). The biggest thing to keep in mind when grilling steak is that you can always throw it back on the grill if it isn't done enough, but you can't reverse an over-cooked steak. So err on the side of rare and sear that steer over high heat. Let's get to it. 1Preheat your grill to high heat. If you have a sear station or sear burner, get that puppy going too. If you have a sear burner and a steak that is over an inch thick, get one side of the grill (opposite the sear burner) going at about medium-high in case we need to cook it through a little more after the sear. 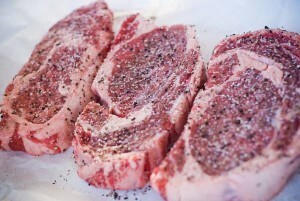 2Remove the rib eye steaks from their packaging and rub them down with some olive oil and then coat a generous amount of Kosher salt and freshly ground black pepper. The olive oil provides just enough fat to help the salt and pepper create a great, caramelized crust. 4Clean and lubricate your grill grates with some cooking oil on a rolled up piece of paper towel (using tongs, of course). 5Place the rib eye steaks on the hottest part of the grill (or your sear burner) and then stand ready with the tongs. 6At this point, you are on flare-up watch. The fat dripping off of those beautiful steaks is bound to create a flare-up. 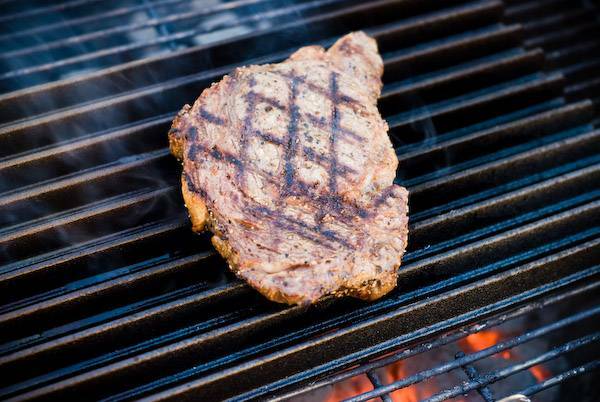 If a flare-up occurs and doesn't go away in a few seconds, simply use your tongs to slide the steaks away from the open flame until the flame dies down and then move then back over the heat. 7Continue to grill with the lid open for about 4 - 6 minutes. 8Flip the steaks over onto the other side, still over the hottest part of the grill. 9Grill the rib eye steaks for an additional 4 - 6 minutes on the other side, lid open, for a medium-rare delicious steak. 10Remove the steaks from the grill and allow to rest for 5 minutes before serving. The resting period is important so that the juices don't run out when you cut into the ribeye, so be patient! See, I told you this was easy! You don't have to over-think a good steak. Buy a thick ribeye with plenty of marbling, use some Kosher salt, fresh black pepper and then concentrate on cooking it properly and you will wow your guests. Great method! Thanks for sharing! Damn that was so easy and delicious!! I appreciate the keeping it simple method. I had the perfect char on my ribeye and great eating all the way through. Better than going out to eat at a steakhouse and at least 25% of the price. Great instructions. Also helpful to have a instant read digital thermometer. If you don’t have on however, these instructions will get you real close. Thanks! Fanatastic!! I let it rest on the side of the grill and added a few tablespoons of sweet butter on top of each steak, then closed the lid for 5 minutes. It was a perfect rare-medium rare, and was close to fork tender with a light crust. Best steak I have ever cooked. My Steaks turned out perfect. Thank you. Following the method made my steak so delicious I came in my pants. Thanks. I’m new to grilling and love my steaks med rare. Just made these for dinner and my dear husband almost licked the plate when he was done. We used 1.75″ thick strips and they were gorgeous inside and out. Medium rare after 4 mins on each side at our grill’s sear station. Thank you for the really easy-to-follow instructions. My first attempt at grilling my own steak was a success because of you! Bravo! best to have the steaks at room temperature before cooking as well. Great recipe, easy instructions, and excellent results!! I have gained confidence in making a steak for my family, and they love it!!! Great! I’ve always had trouble grilling steaks. 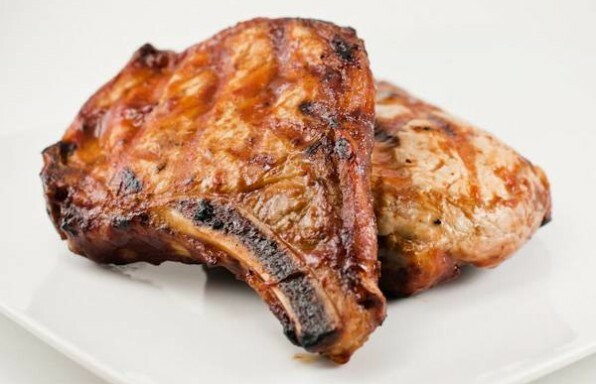 We marinate ours in a solution of Worcestershire sauce and soy sauce for about 4 hours. I used 6 minutes per side and they were perfect. Thanks for your help! You bought a great piece of meat. Best steak I’ve made this summer!!! Best steak I grilled this year!! That’s the way to do it just like MTV. Really the best from A&S market . Excellent! I have always made my steaks way too overcooked and tough. My family loves medium rare….this method gets u there!!!! Great recipe and simple. Steak was superior to most resturants. Instructions are perfect. I’m always nervous I’m going to ruin my ribeye steaks but have this bookmarked and confidence prevails. For a little decadence, rub some butter on the resting steak. Good restaurant tip. Simple and effective. Perfect char. The resting part is so incredibly important. The juice is locked into the riders of the steak. The mostness blew me away. Give it a test cut a morsel off of an end try it out. Now put that steak under foil for five mins and try it again. The wait is worth every mouth full. Beautiful steaks, perfect @ 5 minutes.add a 90 degree graph – paper sear pattern, and you’ve got a Steakhouse perfect meal !! Following instructions ………. GREAT !!!!!!!!!!!!!!!!!!!!! Best steak I’ve ever grilled!!! Thanks!!! Our steaks turned out wonderful!